The Secrets of Baconhenge : The Bryant Park Project Too cool to eat. Thousands of people are headed to Stonehenge today to celebrate the summer solstice, but if you can't make it all the way to England, you can always celebrate at home with your own personal "Baconhenge." Carin Huber, an editor and project designer for the online magazine AntiCraft, created "Baconhenge" out of French toast sticks and bacon assembled with bamboo skewers. We talked to her about the sculpture on the show today and she offered to share her recipe with us. It's posted after the jump. Place a baking rack on a baking sheet. (You may wish to line the baking sheet with aluminum foil, to make clean-up easier.) Select 10 or 12 (it must be an even number) French toast sticks, of fairly uniform size and rectangular shape. It makes no difference whether they are center- or crust-cuts. Wrap slices of bacon around individual French toast sticks. Take care not to stretch the bacon very much, as this will cause it to shrink excessively during cooking, warping the French toast sticks. On half of these, wrap the bacon so that the end of the bacon strip lies over the end of the French toast stick. Then, carefully drive 2 bamboo skewers end to end through the sticks. With the kitchen shears, cut off the excess skewer length, leaving about 1 inch protruding from each end of the French toast sticks. On the other half of the French toast sticks, wrap the bacon so that the end of the bacon strip lies on the underside of the French toast stick, near the end. Arrange all of the bacon-wrapped French toast sticks on the baking rack. Set this aside, and pre-heat oven to 500 degrees, while you prepare the frittata ingredients. In the cast iron skillet, heat about two tablespoons of cooking oil over medium heat. Add the vegetables, and cook until the potatoes are about 3/4 of the way done, stirring occasionally. They should be soft on the outside, but somewhat firm on the inside, when pricked. While the vegetables cook, break the eggs into the bowl, and beat lightly with the whisk. Add the water, salt, and pepper, and mix well. Place the bacon-wrapped French toast sticks in the oven. Bake for 15 to 20 minutes, checking frequently, while you cook the frittata. Stir the vegetables once more, add a little more oil to the skillet, then add the beaten eggs. Allow the frittata to cook until the bottom has set well, and the top looks slightly underdone, about 15 to 20 minutes. When they are done, remove the bacon-wrapped French toast sticks from the oven, and set aside to rest a few minutes. Turn the oven up to Broil. Place the frittata in the oven, on a center-or-higher rack (or under the broiler) until the top begins to brown, about 2 to 5 minutes. Watch it carefully; it can overcook quickly. Remove the frittata from the oven. 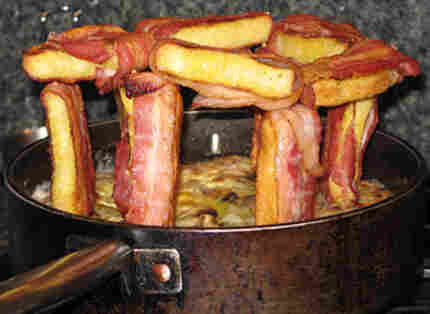 Begin assembling the henge: Lay 2 skewered bacon-wrapped French toast sticks together on your work surface. Create a trilithon by spearing the ends of a non-skewered bacon-wrapped French toast stick lintel on just one skewer of each upright French Toast stick. If necessary, push the skewers through so that they are not visible at the top of the trilithon. Spear another lintel on the free skewer of one upright, then add another upright under the end of the new lintel. Place your double trilithon upright on the frittata, an inch or two from the side, following the curve of the skillet. Poke the bottoms of the skewers down into the frittata. Have your assistant hold the trilithons in place while you continue adding uprights and lintels, until the circle is closed, and the ring of standing "stones" complete.